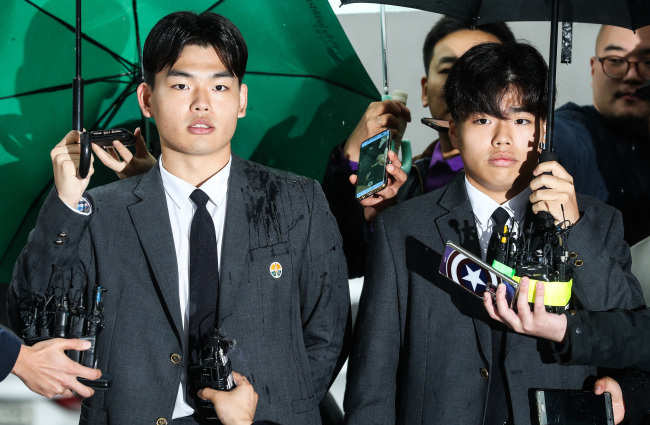 Lee Seok-cheol and his brother Seung-hyun -- both members of teenage boy band The East Light -- attended the Bangbae Police Station in southern Seoul, Friday, to give additional statements to police regarding the alleged assaults at Media Line Entertainment. In front of reporters who had gathered in front of the police station, Lee, 18, said he’d lived in fear due to the threats and beatings. “I hope my actions do not cause any more victims (of assault). I was only able to make it this far as I held great aspirations of becoming a singer. This whole process is extremely painful and difficult for us,” Lee said. In a media report released Oct. 18, Lee Seok-cheol, the band’s 18-year-old leader and drummer, accused its producer, surnamed Moon, of physically assaulting and verbally abusing the members of The East Light. He also said the head of the boy band’s agency, Kim Chang-hwan, had turned a blind eye to the abuse. During a press conference held the following day, Lee said the producer had threatened to ruin his music career if he told anyone about the abuse. He said that was why he felt unable to tell his mother when she asked him about the bruises on his body. In response to the allegations, Kim previously apologized for his “inadequate” management of his employees. But Lee Seok-cheol said Friday that the agency had threatened the two brothers, blaming them for The East Light’s disbandment. Media Line on Monday announced the boy band’s disbandment amid controversy. The same day, the Lee brothers filed a police complaint against Kim and Moon regarding the assault case.